KIEV, Ukraine -- Ukraine says it and four other countries have launched a push for the creation of an international criminal tribunal to bring to account those responsible for the downing one year ago of Malaysian Airlines Flight MH17 over eastern Ukraine. 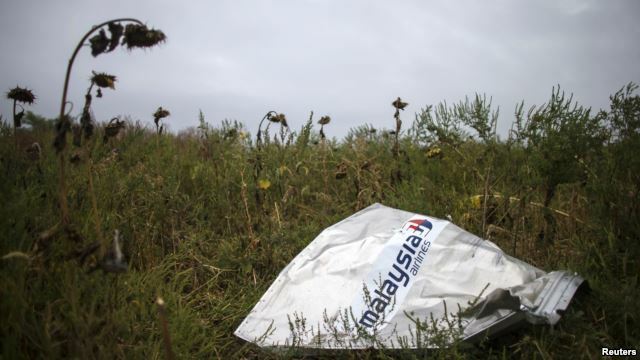 A piece of wreckage of downed Malaysia Airlines flight MH17 is pictured near the village of Hrabove, Donetsk region, eastern Ukraine, Sept. 9, 2014. A petition by Australia, Belgium, Malaysia, the Netherlands and Ukraine has been submitted to the United Nations Security Council, the Permanent Mission of Ukraine to the U.N. said in a statement released late Monday. Flight MH17 crashed on July 17 of last year in Ukraine’s Donetsk region in the midst of a conflict zone on territory held by pro-Russia separatists fighting Ukrainian government forces. All 298 people on board, most of them Dutch, were killed. Western intelligence agencies say the plane was brought down by a Russian-made “Buk” surface-to-air missile launched from separatist-controlled territory. Preliminary results of a Dutch-led investigation reportedly suggest the missile was launched from a Russian-owned battery that was most likely manned by a Russian crew. Final conclusions of the probe are expected later this year. Russia has blamed the downing of the airliner on a Ukrainian missile, also insisting that Kiev bears ultimate responsibility for the incident as it happened in Ukrainian airspace. Ukraine has rejected the claim. In announcing the petition to the U.N. Security Council, Ukraine’s Permanent Mission cites Security Council Resolution 2166, passed unanimously days after the downing of MH17. The resolution called for "efforts to establish a full, thorough and independent international investigation into the incident” and for all U.N. member states "to provide any requested assistance to civil and criminal investigations." “The establishment of an international criminal tribunal… would send a clear message that the international community will not tolerate acts that threaten international peace and security by endangering civil aviation,” Ukraine’s mission said in its statement. Russia, a veto-wielding member on the Security Council, has previously voiced its opposition to the idea of a tribunal. "I don't see any future for" this initiative, Russian U.N. Ambassador Vitaly Churkin said, according to Russian news agencies. "Unfortunately, it seems that this is an attempt to organize a grandiose political show, which only damages efforts to find the guilty parties,” Churkin was quoted as saying earlier this month.